The ideal choice for every home and every piano player, the Ritmüller has been favourably compared to pianos costing thousands more. The Studio R8 (151cm) is the smallest grand piano made by Pearl River in their Ritmüller series. 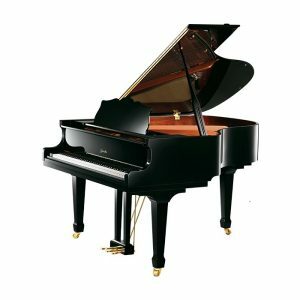 The precise feel of the keyboard touch as well as its richness of timbre make this grand piano unique in its price range. Designed by a leading European master piano maker the R8 incorporated classic designs with innovations and German parts that create an outstanding musical bass section compared to the competition. 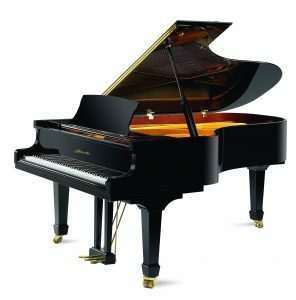 The Ritmuller has an upper section with sustain and musicality and a fast responsive action which delights any pianist. From the soft-close fallboard and tapered legs to the adjustable music desk and twin position support for the bevel-edged top lid, this is a beautifully designed baby grand piano. The longer key depth enables you to control and feel the music projecting from both sides of the soundboard. This European-styled grand piano is ideal for those with restricted space or access but who have a taste for the tone and touch of a grand piano. Length 151mm, Width 150cm, Height 99cm Weight 289kg. Available in black or white polished luxury cabinet finishes. The SALON R9 grand piano is world-class being dynamic in sound, reliable in daily use and delightful to play with a responsive touch and sensitive dampers. This noble instrument makes it easy to express even small nuances. Length 160cm, Width 150cm, Height 99cm, Weight 318kg. Available in black or white polished luxury cabinet finishes. 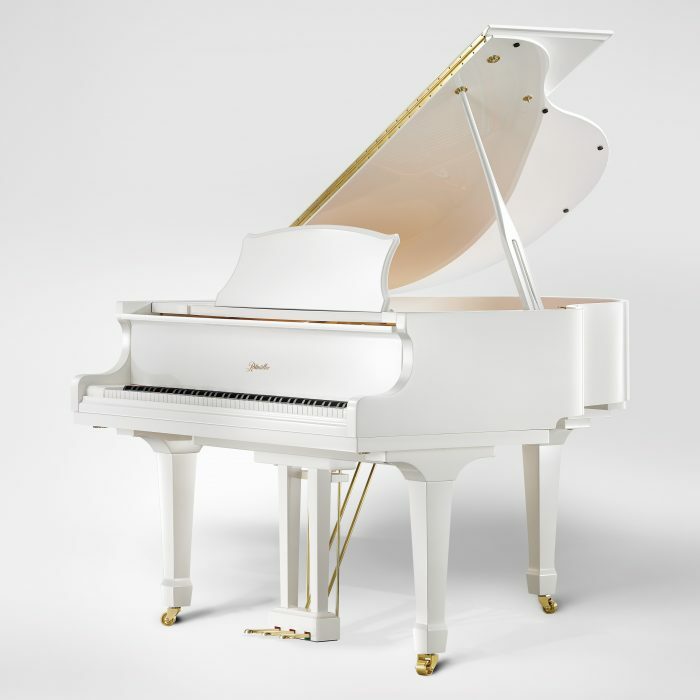 The Ritmüller Conservatory 188cm/6ft 2in is a truly professional grand piano due to its solid design, long-standing reputation and affordable price. A performance instrument tailored to domestic home environments, smaller performance venues and demanding educational requirements. 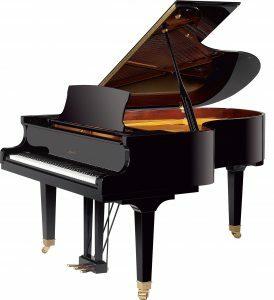 Boasting the tone of a concert grand piano but in comparatively compact proportions, the Conservatory 188 is a popular choice for those seeking a larger grand piano with increased projection of tone, yet at an affordable price. The Ritmüller sound range is even and consistent with a bright treble, a full tenor and a rich bass. Together with an even and sensitive touch, Ritmüller pianos offer the potential of a perfect performance to pianists ranging from the beginner to the professional musician. Ritmüller uses the latest materials and precision manufacturing techniques to ensure the entire piano is made to the highest standards of quality and performance. A perfect mid-sized grand from Pearl River, the world’s largest piano manufacturer. Length 188cm, Width 149cm, Height 99cm, Weight 289kg. Available in black or white polished luxury cabinet finishes. Brilliant sound and the finest playability. The Semi-Concert 212 is amongst the greatest grand pianos in it sonority, brilliance and playability. The fantastic looks of the Semi-Concert 212 transform your home into a concert hall. Any school or conservatoire looking for a performance instrument at a below expectation price should sample the Semi-Concert 212 widely acclaimed and with rave reviews. Length 212cm, Width 151cm, Height 99cm, Weight 378kg. Available in black polished luxury finish with brass concert wheels.